Hospitality Products is the business that operates the Hospitality Wholesale website in Australia. The Hospitality Products website is a specialty online store that has gone to great lengths to source the world's best product ranges designed specifically for the hospitality industry. Whether your restaurant, cafe or hotel is big or small you succeed by producing the best. 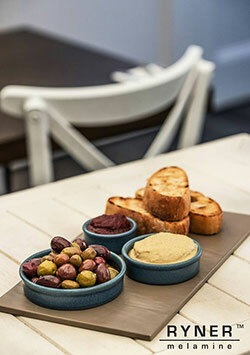 Hospitality Products Australia's range of products is the best in Australia. From cookware to cleaning utensils, quality knives and glassware, the most comprehensive ranges of catering equipment and restaurant products are available for you to browse and order in a simple to use online store that in a few easy clicks will have thousands of hospitality and catering products delivered to you anywhere in Australia. We guarantee you only the best in quality kitchenware and also guarantee that our prices will please you. With brands like Bormioli Rocco, Chef Inox, Paderno, Royal Porcelain, Stolzle Lausitz, Tablekraft and Thermo Hauser you can be sure your kitchen will be working efficiently. As a specialty online store we can devote all our resources to ensuring the best service for you. Your order will be responded to within the shortest possible time. Packing and dispatch are done both quickly and with care so that on delivery you can begin to do what you do best because we have done what we do best - ensure you have the best quality cookware and kitchen utensils in a timely and not over priced manner. All the prices on our website are quoted excluding GST. We will add a small shipping cost to your order at checkout - you can review our shipping prices at Shipping and Returns. What happens when I order from Hospitality Wholesale? Before you can buy from us you need to register your details to create an account. Once you have registered you will be able to return to our site and login any time. Our system allows you to add products to your cart and provided you are logged in, they will still be there when you come back to our website. To create a shopping cart, find the product you want to add to your cart and simply click on add to cart. If you are not logged in then the products will be added to a Guest account, however you will still need to login or register before you can check out. If you have created a guest cart, when you log in these products will be added to your cart. Before you check out, you can view and modify your cart in My Account. When you are ready to place your order, click on the Checkout button next the cart in My Account. Enter your address details, your choice of payment method and then confirm your order. Once we receive your order we will confirm that all the products are available. Some times products you have ordered are not available for immediate delivery. A member of our team will discuss with you whether you want to remove the unavailable product from your order, wait for all of your order to be available, or split your order and receive the available products now and the unavailable products when they become available. Once we have confirmed your order and received payment we will organise for your order to be shipped. The products are not always in the same location, so we will get your order together and ship the products to you. Shipping time is normally 5 - 10 days from date of payment pending availability. We will always endeavor to delivery your order as quickly as we can. Sometimes problems will arise and this process will take longer. In this case you will be advised as to the status of your order. Depending on the products you have ordered we may request a street address instead of a PO BOX if it is more likely that we will send your order via a courier. All orders must include a valid postal address. If there are special delivery instructions you can notify us. We will ship your order either with Star Track Express or Australia Post. You can navigate our website by category and subcategory or by brand and brand line. If you still can't find what you want you can try using our hospitality product search. Try just searching for a single keyword. If you still can't find what you want then we probably don't have it. Even if we don't have the product on our site we may still be able to supply large orders of the product you want. Contact us for more information. Hospitality Products is uniquely positioned to provide custom printed kitchenware and hospitality products. Whether you are running a promotional products giveaway or wanting to brand products to use in your establishment such as glasses or cups. Our team can organise high quality printing of your logo or message on the product of your choice. Don't forget, we can organise indent orders for large volumes of a product and you can expect to save lots off our already low prices. We specialise in delivering large quantities of kitchenware and hospitality products for businesses who want great prices and are prepared to wait 6 to 12 weeks. Contact us for more information about indent ordering.